March 10, 2017 March 10, 2017 - by Kaitlyn Franz - 3 Comments. 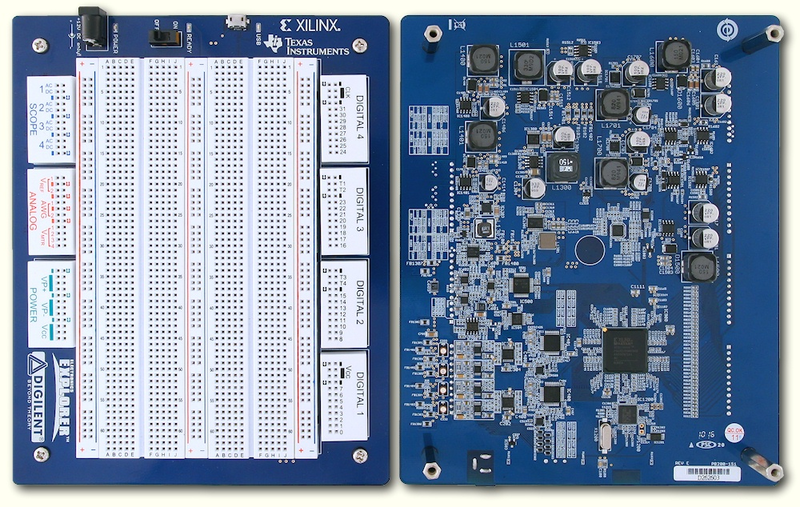 WaveForms 2015 is the user interface that controls the Analog Discovery 2 and Electronics Explorer Board, and gives access to all of their benchtop functionality. We have just posted a new version of WaveForms 2015, version 3.5.4 available for download on the wiki. WaveForms 2015 3.5.4 left the overall look and existing functionality of the Analog Discovery 2 alone, but has added some very useful options, and made user experience improvements. 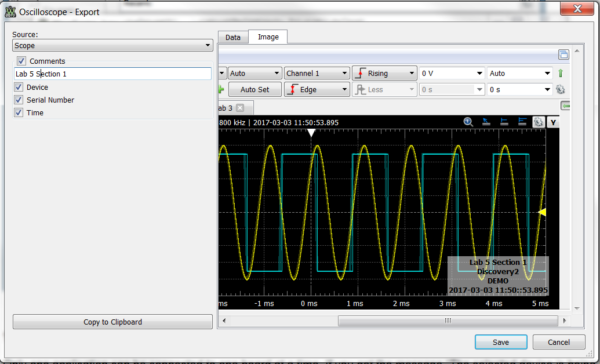 The Oscilloscope has a new Spectogram view. The Spectrogram is a visual representation of the spectrum of frequencies in a sound or other signal as they vary with time. The horizontal axis represents time, the vertical axis is frequency; a third dimension indicating the amplitude of a particular frequency at a particular time is represented by the intensity or color of each point in the image. The Spectogram view in the new version of WaveForms 2015. Separate acquisitions now keep their own time positions and span. In both the Logic Analyzer and Oscilloscope tool, you can open multiple acquisitions in separate windows. This allows you to keep a previous acquisition up in case you need to compare or review it later. Previously the time position and span options controlled all tabs, but now each tab remembers it’s own time position and span options. 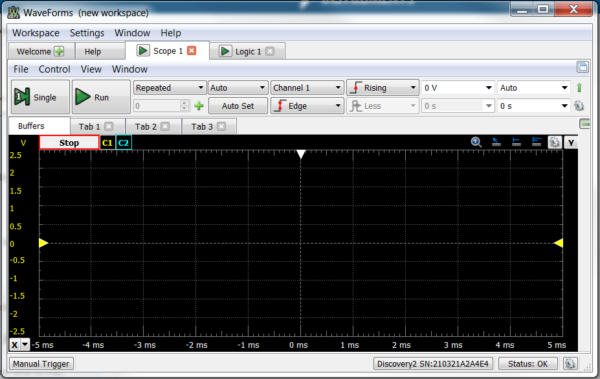 The Oscilloscope window with multiple tabs open. Each tab will remember its own time scale settings. 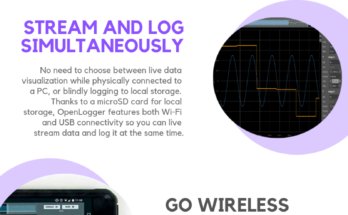 Logic Analyzer triggering is simplified. In previous versions if you wanted to do advanced triggering the custom trigger menu gave the ability to control custom triggering, however, this was a overly complicated interface. In this version, that interface was removed and the Simple, Pulse, and Protocol interfaces replace the functionality. 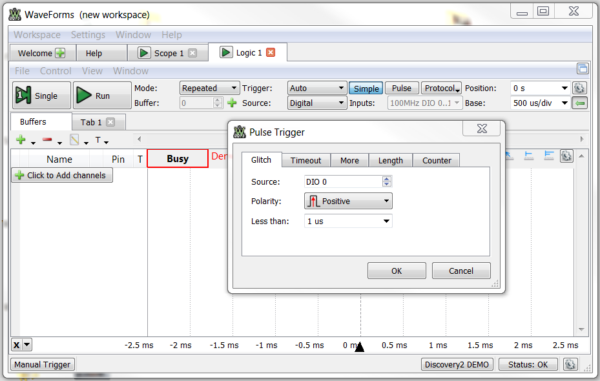 The new Logic Analyzer trigger settings, with the simple settings open. Custom text can be added to an exported picture. In previous versions when images were exported a time and date stamp, as well as device stamp were added to the image. Now in addition to the automatic text you can add custom text. So if you want to label a specific acquisition with details about the circuit or behavior you’re observing you can. The process of exporting an image. The first line of text allows for custom text. When you open the device manager to select your device you may notice an addition. The Digital Discovery, which is coming very soon. If you’d like to preview the features of the Digital Discovery you can use DD demo mode in WaveForms 2015, or check out it’s resource center. You’ll find a getting started guide, and a walk-around for each tool. For the full list of changes view the official change log on the reference page. 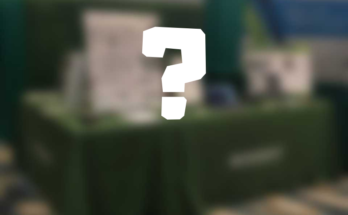 Are you going to ECEDHA 2019? We have an exciting announcement! So no new updates are available yet?